NEW YORK (CNNMoney) -- Sprint ended its $9 billion agreement with LightSquared on Friday, after it became increasingly clear that LightSquared's network may not get off the ground. LightSquared, owned by Philip Falcone's Harbinger Capital Partners hedge fund, is trying to enter the wireless market as a wholesale provider of 4G service to battle giants like Verizon (VZ, Fortune 500) and AT&T (T, Fortune 500). By selling its service wholesale, it hopes to provide the infrastructure and the network, and it will allow its business partners to sell the service. Among the 40 partners that LightSquared had signed was Sprint (S, Fortune 500). The nation's third-largest wireless carrier was hoping to build out and license a 4G network to LightSquared, which the wholesaler would use in tandem with its own infrastructure to launch its service. In turn, Sprint would have been able to use up to 50% of LightSquared's network capacity for its own customers. The 15-year agreement, inked in July, would have given Sprint some much-needed cash and LightSquared some crucial bandwidth. But LightSquared hit a major snag a month ago when interference issues with GPS equipment forced the Federal Communications Commission to revoke a waiver that would have allowed the company to turn on its network. In a statement, LightSquared called the termination of its agreement with Sprint "in the best business interests of both companies, and was not unexpected given the regulatory delays." "For LightSquared, Sprint's decision will enhance our working capital and provide more flexibility," said Doug Smith, interim co-CEO of LightSquared. The company underwent a management shakeup late last month, when its CEO, Sanjiv Ahuja, resigned following the regulatory debacle. Sprint had twice extended its tentative agreement with LightSquared in hope that the company could gain regulatory approval, but Sprint's faith in that process ended Friday. 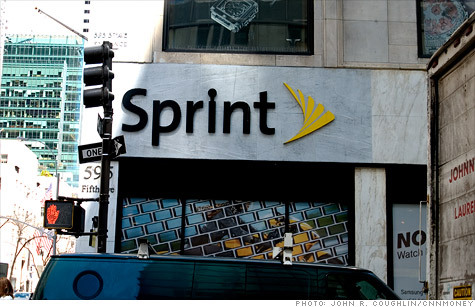 "Due to these unresolved issues ... Sprint has elected to exercise its right to terminate the agreement announced last summer," a Sprint spokesman wrote in an e-mailed statement. "We remain open to considering future spectrum hosting agreements with LightSquared, should they resolve these interference issues." Sprint said the termination of the LightSquared agreement will have "no impact" on its current customers and "is not material" to the company's business operations. Sprint will return $65 million in prepayments that LightSquared made to Sprint but were never used. The carrier said it still plans on launching its own new 4G LTE network in the middle of the year. For LightSquared, the outlook is much gloomier. The company plans on defending its network's ability to launch without interference issues to the FCC on Friday, the last day the regulator is accepting public comments on its decision to revoke the waiver. But analysts say it is unlikely that the FCC will overturn its ruling. As a result, LightSquared may not last through the year. If LightSquared doesn't receive approval by the end of the year, the company will run out of money and will be forced to sell off its assets, according to Jonathan Chaplin, analyst at Credit Suisse. That's because LightSquared has relatively fixed costs -- with or without customers. LightSquared predicted the company's network and infrastructure would cost $30 billion to operate and maintain over the course of the next five years. So it would cost LightSquared $30 billion to operate a network with zero customers and $30 billion to run a network with 25 million customers. The one thing LightSquared had going for it was its dozens of partnership agreements. But with the Sprint deal dead, LightSquared's other partnerships could also begin to unravel, Chaplin said. "There absolutely is a viable business model there," said Chaplin. "The great shame about LightSquared is that it could have stirred up the industry, and it could have benefited consumers tremendously. But with no spectrum, there's just the fixed cost of running a network."